Intel Skull Canyon is a mini-PC (or NUC for Next Unit of Computing) designed for gaming. The Skull Canyon comes with a 6th-gen Skylake Core i7-6770HQ (base frequency: 2.6GHz, max turbo frequency: 3.5GHz, TDP: 45W) that embeds an Iris Pro Graphics 580. The Iris Pro Graphics 580 has 72 EUs (Executions Units) (compared to the 24 EUs of a HD Graphics 530 / core i5 6600K), and is Intel’s most powerful integrated GPU. The Skull Canyon includes an HDMI 2.0 output which is great for 4K @ 60Hz on UHD TVs. One Mini-DisplayPort 1.2, four USB 3.0 ports and one Thunderbolt 3 (40Gbps) port are also available. 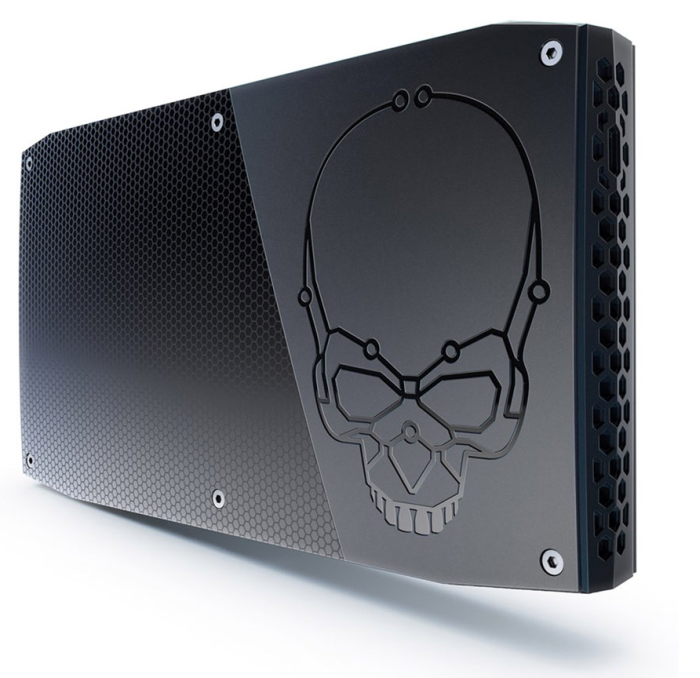 The Skull Canyon does not include the memory and storage unit (M.2 slot for SATA3/PCIe X4 Gen 3 NVMe/AHCI SSDs) Read more at http://www.legitreviews.com/meet-intel-nuc-nuc6i7kyk-skull-canyon-arrives-thunderbolt-3_180007#t4EVBrLWtlS6DTVh.99), you have to bring you own components. This mini gaming PC is priced at USD $650 and should be launched in May 2016. Skull Canyon fact sheet can be found HERE. March 16, 2016 — At Game Developers Conference (GDC) 2016, Intel announced a new Intel NUC kit, code-named Skull Canyon. A mini PC with a 45-watt, quad-core 6 th Generation Intel® Core™ i7 processor and Intel® Iris™ Pro graphics, the new Intel® NUC (NUC6i7KYK) unleashes maximized performance for intense game play or intensive workloads. Intel Iris Pro graphics let people edit photos and videos like a professional or immerse oneself in vividly rendered, seamless 3-D gameplay, all in brilliant 4K resolution on three monitors at once. Skull Canyon also includes Thunderbolt™ 3, enabling a single compact port and single cable to easily connect to 4K displays, high-speed storage and other devices, in addition to great graphics performance by connecting to high-end, external graphics card(s) through a device such as the new Razer Core * . All of this comes together to provide a great gaming experience in a system less than 0.7 litres in size! The 6 th Generation Intel Core i7 processor-powered NUC has a completely redesigned chassis and stylish case, allowing enthusiasts to take full advantage of every GHz of the quad-core processor without overheating – making this Intel NUC literally cool.